Beth welcomed everyone and introduced this month’s guest speaker, Nancy Keating, CEO of Challenge Enterprises of North Florida, who came to speak to us about the power of collaboration. Challenge Enterprises is known for helping those with a wide variety of disabilities obtain employment through service contracts with government agencies and local businesses. In 2011, it was awarded the Reinhold Foundation’s top honor for being the ‘best of the best’ at representing what service agencies can do. 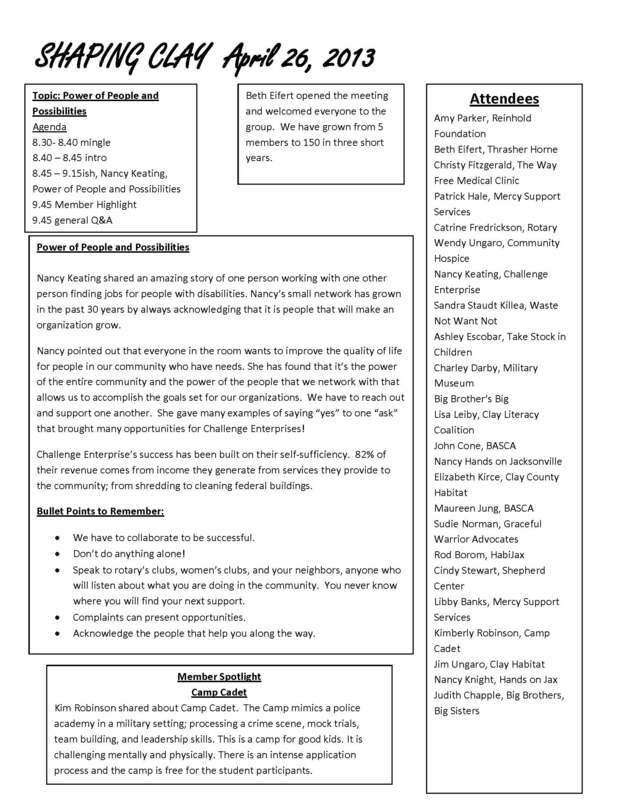 Challenge Enterprises has also been acknowledged by the Nonprofit Center of Northeast Florida for its ability to partner with others to achieve results. We also heard from Kim Robinson, Executive Director of Northeast Florida Camp Cadet who was our member spotlight speaker for April. The Camp mimics a police academy in a military setting: processing a crime scene, holding mock trials, and developing team building and leadership skills. This is a camp for good kids. It is challenging mentally and physically. There is an intense application process and the camp is free for the student participants. To view, download, or print the April Meeting Notes click here.